New Jersey Lemon Law: If you have purchased a new vehicle and the use, value or safety have been substantially affected you might have a Lemon Law claim under New Jersey law. There is both a used and a new car Lemon Law but they differ substantially. The consumer's rights under these New Jersey laws are excellent and provide some excellent remedies for injured consumers. Odometer Fraud and Roll Back: Purchasing a car with an inaccurate odometer and the seller knew or had reason to know. New Jersey Courts provide really good remedies for these victims. Recalls: Recalls by the manufacturers have been extensive and affected the lives of millions of Americans. Here is some help for consumers: Check recalls by VIN here. Takata Recall information. General recall resource. Dealership Bait and Switch Advertising: Baiting customers with nonexistent deals or prices to get them in the door and sell them a product. Special promotional prices and special pricing and failure to honor those prices contained in the advertisements. What happens if you refuse to pay the increased price? Can you sue? Yes. Lemon Law Refund: The Lemon Law calculates a refund based on the purchase price and the mileage. The Lemon Law refund is based on mileage at the time of the first repair attempt and the purchase price. Prior Undisclosed Damage on New and Used Cars: Many dealers sell vehicles that have prior undisclosed damage or a bad Carfax. The damage can be extensive or minor to both used and new cars. There are many claims available when the damages cars are sold to unsuspecting customers. There are claims for fraud and consumer fraud available. If you think you have been a victim of auto dealership fraud please call The Law Office of Jonathan Rudnick LLC. Our New Jersey consumer fraud lawyers have significant experience in suing car dealerships for fraud , breach of warranty and consumer fraud. If you were a salesman and employed by a dealership and they wrongfully calculated the commissions and added costs not agreed to in the pay-plan. What does the pay plan permit as costs and addition to the reduction of gross commissionable proceeds? Our New Jersey consumer fraud attorneys help consumers who have been subject to fraud and deceptive practices. New Jersey laws provide very powerful remedies for those victims of fraud and consumer fraud. If your car was in an accident before you purchased the car or damaged while in dealer custody and control you probably have a claim if they failed to advise you of this information. When you purchased a damaged car you are losing money. Consumer fraud is a very serious matter. The inappropriate conduct by car dealerships and other unscrupulous businesses cost customers millions of dollars in the State of New Jersey. The New Jersey Consumer Fraud Act can be enforced by either the State or by individuals acting as private attorney generals. This means that if you have sustained damages as a result of conduct that is prohibited by the Consumer Fraud Act you can enforce the Consumer Fraud Act by starting a lawsuit to get you money back or to recover ascertainable losses with the addition of your attorney fees and costs. There is a required tripling of any damages caused by violations of the Consumer Fraud Act or unfair and deceptive practice (UDAP). The Judge is required to triple the damages according to the Consumer Fraud Act and also add the attorney fees to any judgment you might obtain against the car dealership in court or arbitration. THE LAW OFFICE OF JONATHAN RUDNICK LLC IS DEDICATED TO THOSE WHO NEED HELP. WE DO NOT REPRESENT INSURANCE COMPANIES AND WE NEVER WILL. WE REPRESENT VICTIMS. WE REPRESENT THOSE WHO HAVE BEEN VICTIMIZED BY DISHONEST BUSINESSES AND HAVE SUSTAINED PERSONAL INJURIES AND WANT TO FIGHT BACK. Our New Jersey consumer fraud lawyers will help you when you need it most: Personal injury, consumer law, employment law and Lemon Law. The most important factor in hiring a lawyer is hiring someone you can have confidence in, who you trust and who answers your questions. We are here for you. Let us help you when you need it the most. Buying a car can be a very difficult challenge. It is even more challenging if you feel you have been victimized, lost money or subject to deceptive practices while purchasing the vehicle he so desired. You might not be exactly be able to identify the specific conduct without a careful, experienced review of the documentation or the advertisement by an experienced consumer attorney. After a consumer attorney has reviewed the documents listened to your first-hand account of the facts you will be able to figure out if you have a claim and/or had sustained a loss associated with any deceptive conduct. The law requires that there be deceptive conduct, that there be some sort of measurable or ascertainable loss and that there is a connection between the deceptive conduct in the measurable or ascertainable loss. Experienced consumer attorneys can analyze the facts determine the appropriate losses and a link the deceptive conduct to the plaintiff losses. Experienced consumer attorneys who have tried cases, reviewed thousands of deals/transactions can provide a precise and detailed analysis as to whether or not you have been a victim and/or have sustained any loss which is permitted to be recovered under the New Jersey Consumer Fraud Act. The purchase of the vehicle can be a very traumatic experience if you have been taken advantage of by a car salesman or other experienced professional. If you think you have been a victim of a deceptive trade practice and have sustained an ascertainable, measurable or quantifiable loss call the Law Office of Jonathan Rudnick LLC to have your documents reviewed and explain the underlying facts. There are numerous types of deceptive conduct that can provide the consumer with a cause of action or claim that can be brought against the selling or a remote dealer. A common type of deceptive practice plaintiff's misrepresenting the condition of the vehicle including but not limited to the fact that the vehicle has not been in an accident when in fact it has been in an accident. This is called an affirmative misrepresentation of fact and it is actionable under New Jersey law. If a selling dealer states that a vehicle has not been in an accident this is an affirmative misrepresentation. It is the obligation of the selling dealer to make sure that the affirmative misrepresentations were affirmative representations associated with the transaction are truthful and accurate. The seller of the vehicle is in a better position than the buyer of the vehicle to assure that the representations with the purchase are accurate truthful and not misleading. New Jersey no longer accepts the common concept of buyer beware. New Jersey has adopted a more ethical standard which permits the purchaser of a vehicle, or any good, to rely upon those representations of the individual or entity selling the particular item. The New Jersey Consumer Fraud Act provides for triple damages attorneys fees and costs those who have been successful, proved a cause of action including but not limited to demonstrating ascertainable or measurable loss. The New Jersey Supreme Court has specifically set forth, demonstrated and declared that it is imperative that the consumer has sustained an ascertainable loss. Without this ascertainable or measurable loss there is no claim under New Jersey law under the New Jersey Consumer Fraud Act. The issue of contract cancellation is very common for consumer contracts. Read Here. Wrongful Repossession Attorney, Wrongful Repossession Lawyer. Your wrongful repossession Rights. Arbitration Agreements in Consumer Contracts: Do I have to Arbitrate my Claims? Can I Cancel My Car Purchase? I was Ripped Off by a Car Salesman or Sold a Bad Car!!!! Recalls and Lemon Law Claims. Is my Car Dangerous? The Fair Debt Collection Practices Act: Do I have a claim? 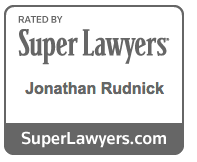 Jonathan Rudnick was selected to the 2016 Super Lawyers list. The Super Lawyers list is issued by Thomson Reuters. A description of the selection methodology can be found at www.superlawyers.com/about/selection process detail.html. No aspect of this advertisement has been approved by the Supreme Court of New Jersey. WHAT TYPE OF THINGS DO SALESMAN DO TO SELL A CAR? We serve the following localities: Camden, Camden County, East Orange, Newark, Essex County, Jersey City, West New York, Hudson County, New Brunswick, Middlesex County, Asbury Park, Hazlet, Keansburg, Keyport, Leonardo, Lincroft, Long Branch, Matawan, Middletown Township, Neptune City, New Monmouth, North Middletown, Port Monmouth, Red Bank, Union Beach, Tinton Falls, and Monmouth County.